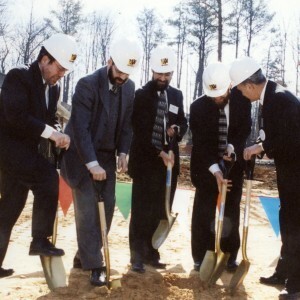 Congregation Ariel officially opened its doors on Shabbat morning August 7th, 1993 at its first home on Sandell Drive in Dunwoody, Georgia. Rabbi Shmuel Weinbaum, who was serving as the rabbi of the Orthodox community in Santa Fe, New Mexico, was selected as the first rabbi. The name for the new shul, Congregation Ariel, was suggested by Rabbi Weinbaum and was approved by the congregation. “Ariel” is the poetic name used to describe the Temple and Jerusalem in Isaiah, Chapter 29. In October 1994, Congregation Ariel engaged Rabbi Binyomin Friedman, well-known member of the Atlanta Scholars Kollel, as its new spiritual leader. The Sandell Drive location held approximately 30 people for services. As the community grew, it became apparent that a larger location would soon be needed. Under the leadership of Louis Taratoot z"l and Sam Eden z”l, our present site was selected. A community-wide fundraising campaign was launched and the funds needed to procure the Tilly Mill location were raised. 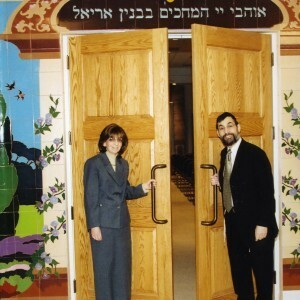 The Friedmans moved to Dunwoody in 1997 and cemented their commitment to a vibrant and dynamic Orthodox community in Dunwoody. Due to the tireless efforts of Rebbetzin Dena Friedman, their home on Westover Plantation immediately became “hachnasat orchim” (hospitality) headquarters for the whole area. This is especially evident on Shabbat, when there is always room for one (or ten) more at their table. Now, thank G-d, Congregation Ariel is a full-service synagogue offering daily morning and evening minyonim, daily classes and learning opportunities, youth programs, Hebrew School, active Sisterhood and Brotherhood, a beautiful modern mikvah, and a variety of educational, social, and religious programs. Congregation Ariel looks forward to the future with enthusiasm and optimism with thanks to the Almighty.